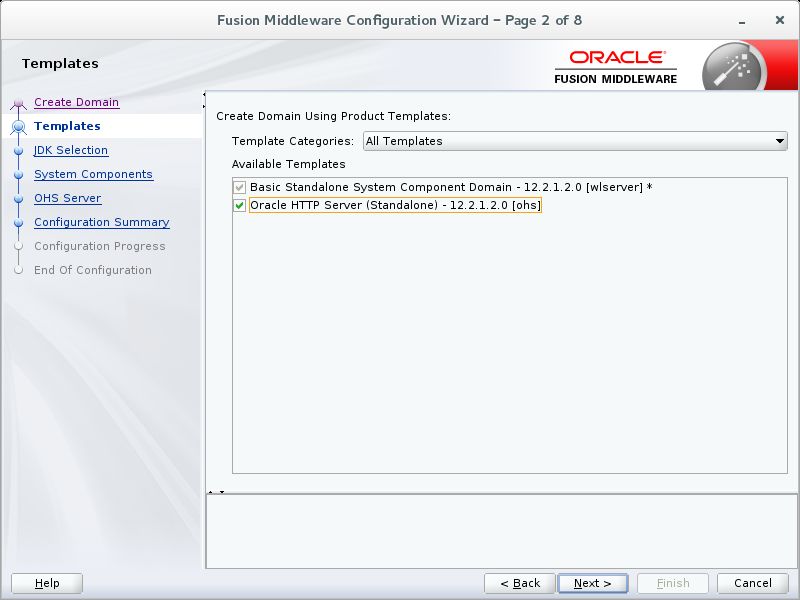 Last week I had an assignment to install and configure Oracle HTTP Server as a reversed proxy in a DMZ. Many years ago I worked with Apache a little, so I had not have the details at hand. Although installing and configuring the HTTP Server is not hard, I found that I had to do quite some searching around to get to all the essentials. To help you out, and to have it logged for myself, let's get through it. For installing the OHS Software I created a script as I did for other FMW installations (FMW Infrastructure, OSB, SOA/BPM, etc.). 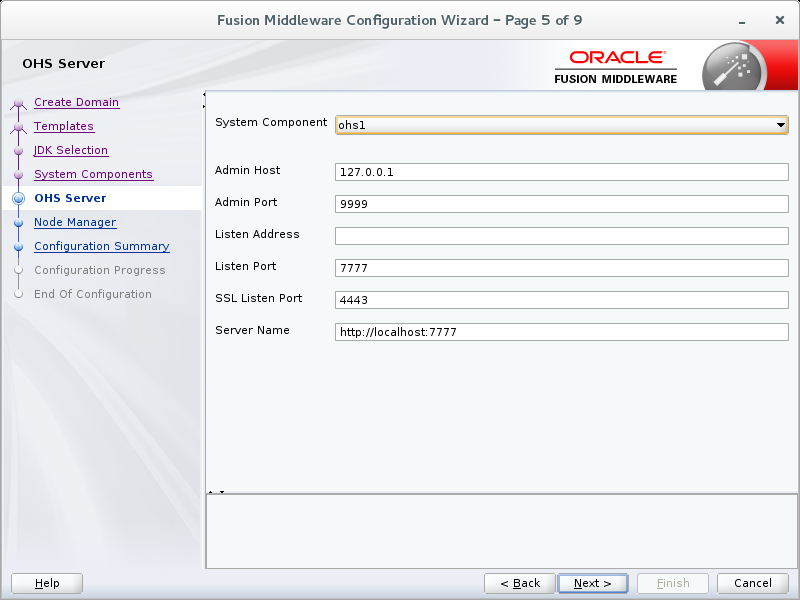 I did my installation on a Oracle Linux 7 VM, that already contained the database and Weblogic. So I did not need to add the necessary packages. See for instance the requirements doc. echo $OHS_INSTALL_HOME/$OHS_INSTALL_ZIP does not exist! The script checks if the OHS Home already exists, if so it concludes that the software apparently is installed already. If not, it checks if the installer is available, and if that is not the case it checks if the zip is available. It will unzip the installer if needed and if one of the checks fail it will stop. A new thing I found out after my earlier blogs is that I learned about the envsubst command that is available in Oracle Linux. It enables you to expand the environment variables that occur in a file. And for this script this is handy, because it needs a response file for the installer, but that contains for instance an Oracle Home to be set to the target $OHSSA_HOME from the fmw12c_env.sh script. In my earlier scripts, when I needed or wanted to install using other folder structures I needed to change both the script and the response file. Now I used the response file saved from the manual installation and then replaced the folder with the particular environment variable. Create a folder structure, place the scripts fmw12c_env.sh, installOHS_SA.sh and fmw_12.2.1.2.0_ohs_sa.rsp.tpl in a folder named scripts. Then create a folder named Zipped/OHS next to it. 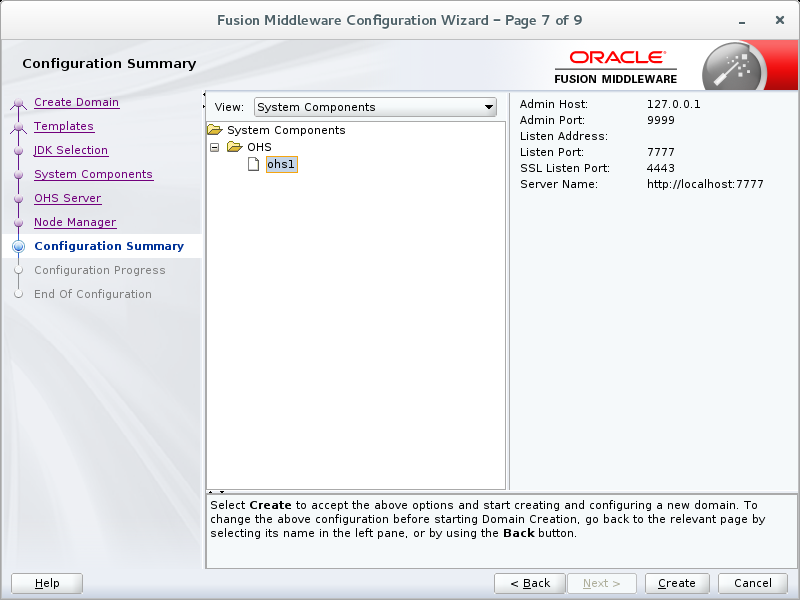 Download the OHS installer from edelivery.oracle.com and save it in that folder. Also create an empty folder named Extracted/stage/OHS next to it. Then run the installOHS_SA.sh. Unfortunately it is apparently not possible to create the domain with a wlst script. Main reason for this (I think) is that the wlst installation in the OHS FMW_home lacks an implementation of the encrypt() method to encrypt a password against the SA-domain folder. 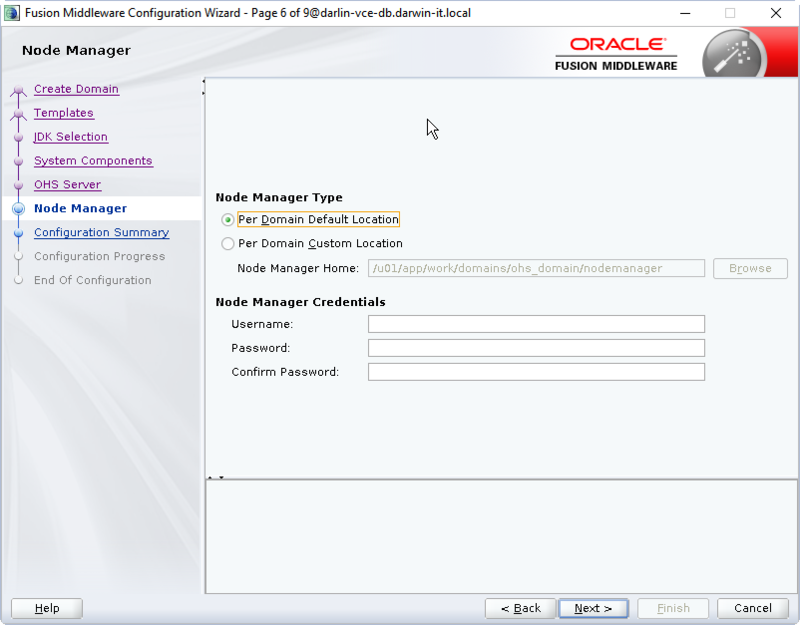 Therefor you can't set the (encrypted) domain password and nodemanager password. And thus you can't start the OHS components in the regular way using the nodemanager. 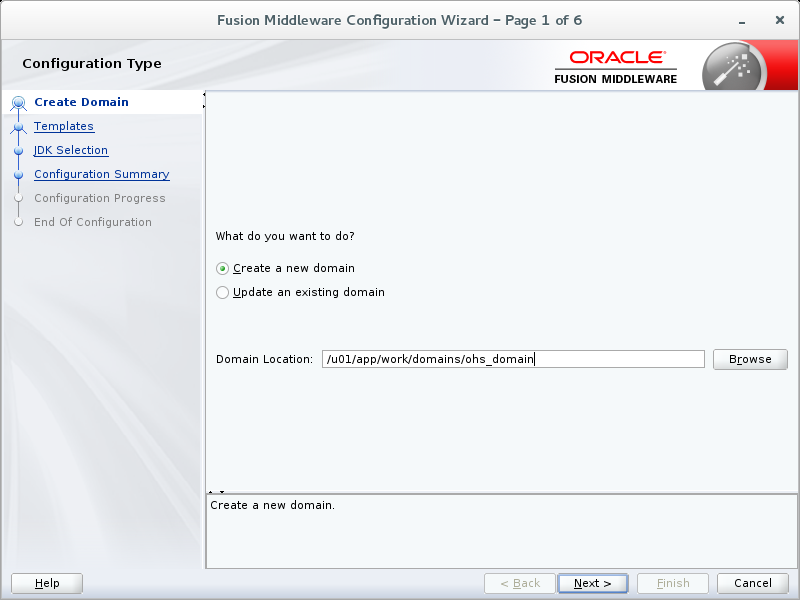 So configuring the domain is done manually using the configurator. Provide a domain home like: /u01/app/work/domains/ohs_domain. 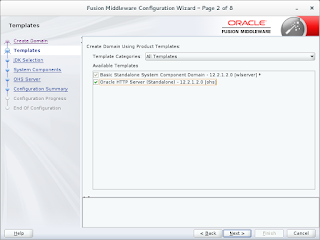 Check the Oracle HTTP Server (Standalone) option. 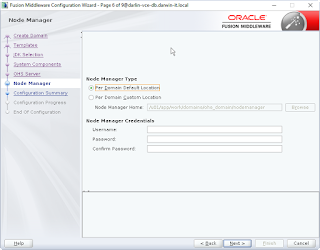 The documentation suggest to select the Oracle Hotspot JDK, delivered with the installation. Here you can add system components to the domain. 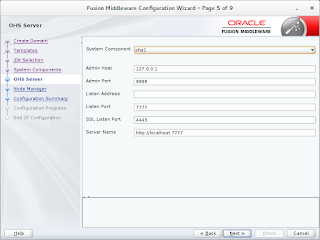 Per system component provide the listen address and port, as well as the Admin Host and Port. Keep the ‘Per Domain Default location’ option. 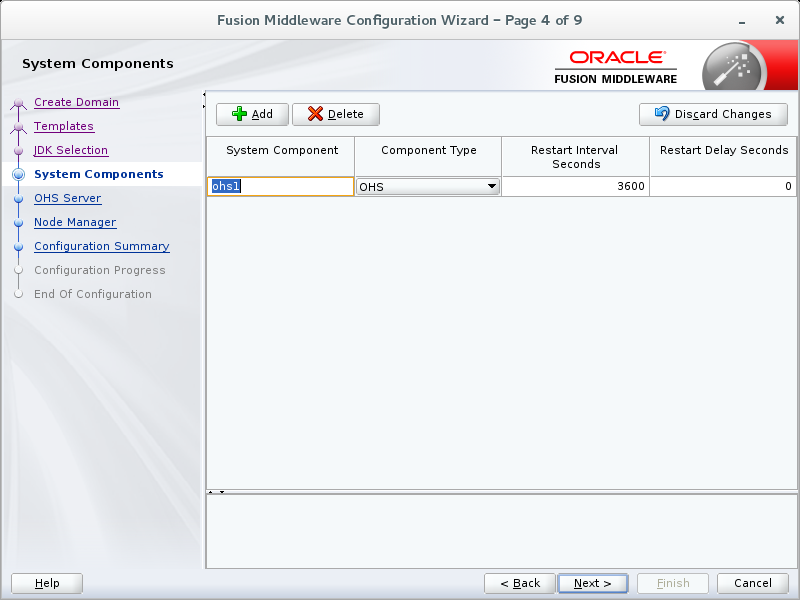 From Weblogic 12c this is the standard. Keep the username weblogic and provide a password. For demo purposes I use the password welcome1. Actually this is the step I couldn't manage to do with WLST. The progress of the creation of the domain. 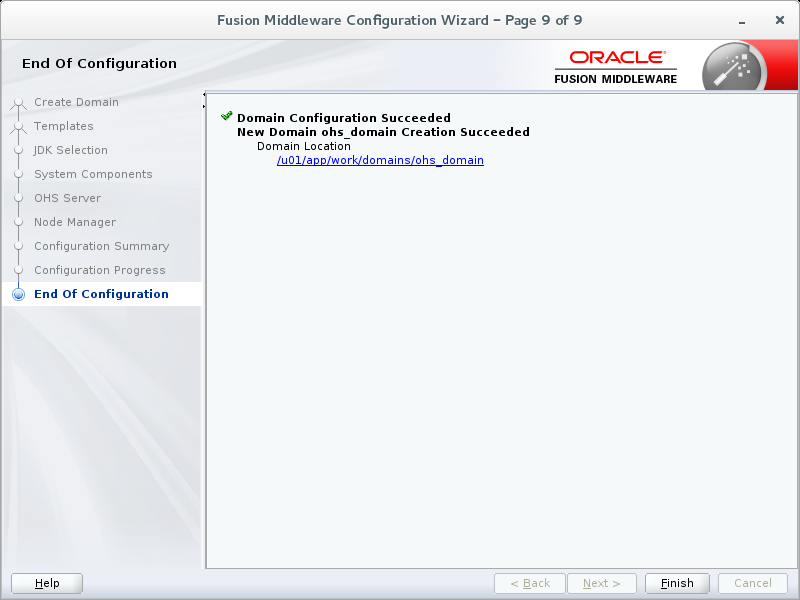 Confirm the configuration of the domain. You'll need to add routes. For the plain http routes you can add a configuration file, like service_vh.conf (where service is the name of the application or purpose for which you want to use OHS). In my case I was routing an APEX application through ORDS, so I named it ords_vh.conf. Place this file the folder $OHS_DOMAIN_HOME/config/fmwconfig/components/OHS/ohs1/moduleconf. All files with extension ‘.conf’ in this folder are picked up automatically by the OHS component. If you already have a nodemanager running, possibly for another domain (not likely when using this in a DMZ) you can use another port. For instance 7555. As a good practice I tend to duplicate the lines, comment out the original ones and change the duplicates. This starts the nodemanager in the background. In my case I had to configure SSL as well. This included creating a wallet with a certificate etc. I'll save that for another article, because this one is already quite extensive.